The Nationally Award Winning Baltimore dog walking service, Barks & Blooms™ now brings you its new doggie daycare service. Located in colorful Hampden in Baltimore City, Barks & Blooms™ Doggie Daycare offers your dog positive socialization in a friendly environment with a trained and professional staff.Barks & Blooms™ was established in July of 2008, starting as a dog walking/pet sitting company. 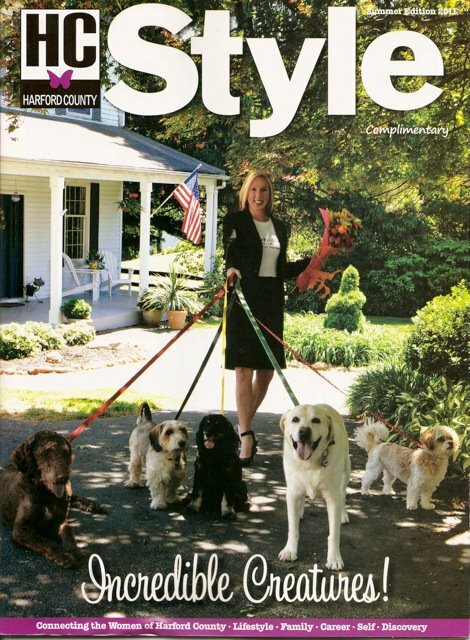 It has since grown to over 50 dog walkers/pet sitters covering Harford County, Baltimore County, and Baltimore City. Whether you are looking to have your dog walked, cat cared for, plants watered, or interested in socialization at our doggie daycare, Barks & Blooms™ has what you are looking for. When your pet is in our care, you can rest assured they are being treated as if they are one of our own. Our Fantastically Fabulous Team of Pet Professionals are dedicated to earn your trust through our integrity and professionalism. playing at the doggie daycare, going for dog walks, and other fun activities. Awarded by Pet Sitters International. This is the largest educational organization for pet sitters in the world. With over 8,000 members around the world Barks & Blooms™ have finished top of the class for 2 years. Colleen McDonough is living proof that you can accomplish anything if you put your mind to it, and it’s never to late in life to do so. truck loads of supplies to head up to the pets in New York and New Jersey. Barks & Blooms™ has been a top fundraiser for the Humane Society: Bronze Sponsor for BARCS. collected over 60 bags of dog food that we distributed to the SPCA and BARCS. Barks and Blooms also volunteers for the Belair Alliance, Homeruns for the Homeless, and Habitat for Humanity.